According to a report recently released by the non-profit Trust for America’s Health – aptly titled “F as in Fat” – South Carolina has the seventh-highest adult obesity rate in the country (31.6 percent). South Carolina also ranks seventh in the country for adults with diabetes (11.6 percent) and seventh for adults with hypertension (36.4 percent). The F as in Fat rate does not include the percentage of adults who are simply overweight, a lower threshold than obesity. The percentage of adults in South Carolina who are either overweight or obese is 66.2 percent, according to an August 20 article in the Charleston Post and Courier. The Introduction to the TFAH report warns, “If we fail to reverse our nation’s obesity epidemic, the current generation of young people may be the first in American history to live sicker and die younger than their parents’ generation.” [You can read the entire report here.] They’re likely to be poorer as well. According to the Centers for Disease Control, the estimated annual medical cost of obesity in the U.S. was $147 billion in 2008 U.S. dollars; the medical costs for people who are obese were $1,429 higher than those of normal weight. Is our famous southern hospitality partly to blame? Of the states with the 20 highest adult obesity rates, only Pennsylvania is not in the South or Midwest. And nine of the 10 states with the highest rates of type 2 diabetes and hypertension are in the South. Several proposals are being considered by South Carolina state leaders, including a limitation on what food stamp recipients can buy with their EBT cards, which would require the federal government’s approval. The S.C. Medical Society has an obesity task force, and the S.C. Chamber of Commerce is also addressing the issue. A new program in the greater Charleston area, Eat Smart Move More, is designed to improve eating habits and increase physical activity. We eat more processed foods and eat out more frequently than our predecessors did. We have become accustomed to larger portion sizes. Poor and rural residents have less access to healthy options. We live farther from work and school and drive almost everywhere we go. Eat more fruits and vegetables and less fat. Drink more water and fewer sugary beverages. Watch less TV and limit your kids’ viewing. Encourage farmers’ market programs and offer vouchers for low income shoppers. Build bike paths and crosswalks. 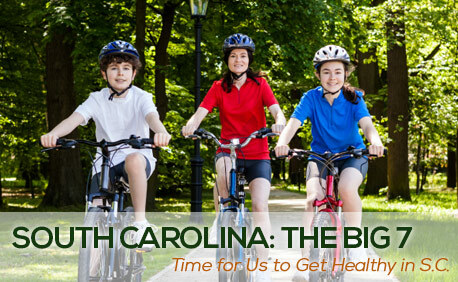 It’s not New Year’s Day, but we think this is a good time to make a resolution to do what we can, as individuals and as a state, to see that in next year’s F as in Fat report South Carolina weighs in lower on the scale and higher in determination.